A new type of snow warning will be issued by the National Weather Service (NWS) this winter to convey the danger travelers face from an extreme reduction in visibility during short-term bursts of heavy snow. A snow squall warning will be issued when conditions warrant by seven NWS offices in the Lower 48 starting in early January. Snow squalls have historically been a contributor to major highway pileups due to their brief but intense snowfall rates, which drop visibility at a moment's notice while slickening roads. Snow squalls can occur in situations where there is no major large-scale winter storm in progress and may only produce minor accumulations. "Annual highway fatalities from these events can exceed fatalities due to tornadoes in many years," the NWS said in its product description for the new snow squall warning. 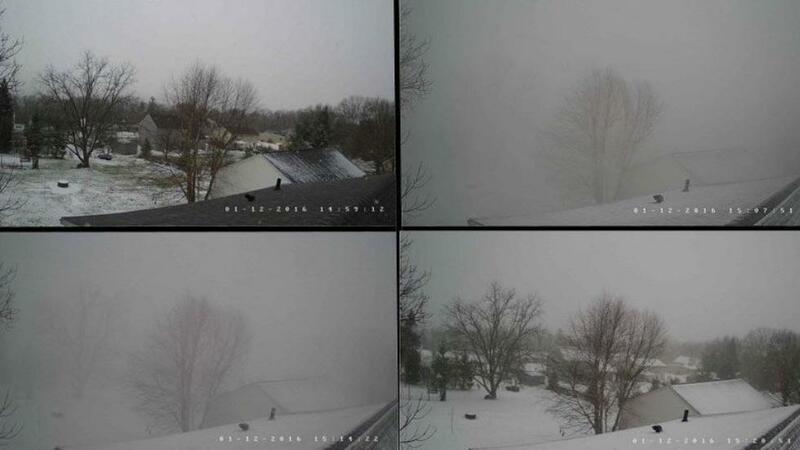 The series of images above show an example of a snow squall in Hollidaysburg, Pennsylvania, on Jan. 12, 2016. Notice how the visibility in the top two images of the series went from good to poor in about eight minutes. At the bottom right, you can see the visibility improve after the snow squall had ended about 13 minutes later. The seven NWS offices that can issue the snow squall warnings starting on or about Jan. 3 are State College, Pennsylvania; Buffalo, New York; Binghamton, New York; Burlington, Vermont; Detroit; Pittsburgh and Cheyenne, Wyoming. Some of the above-mentioned locations near the Great Lakes are prone to lake-effect snow squalls. 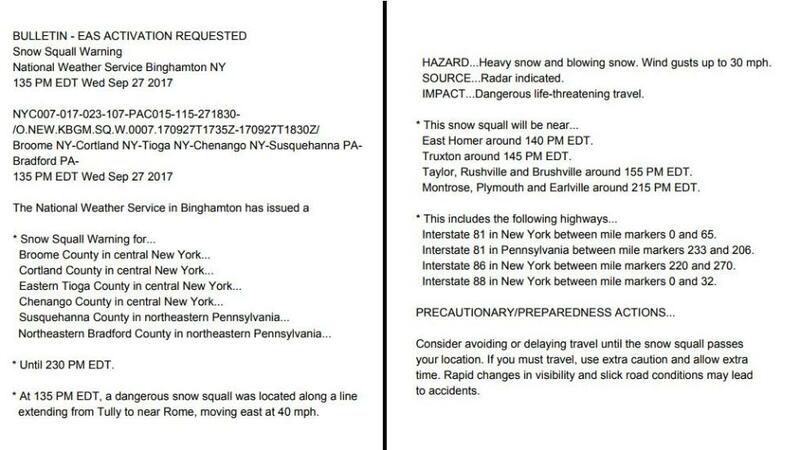 Above is an example of the information contained in a snow squall warning, including cities and highways affected and how long it will last. In general, these snow squall warnings will be of short duration and specify a localized area similar to what you would see with a tornado, severe thunderstorm or flash flooding warning. As with all other warnings the NWS issues, they are targeted at state and local officials, media, the general public and others. Consider avoiding or delaying travel until the snow squall passes your location. If you must travel, use extra caution and allow extra time. Rapid changes in visibility and slick road conditions may lead to accidents. Major highway pileups caused by snow squalls occur every winter. March 3, 2017: A 30-vehicle pileup on Interstate 81 in Schuylkill County, Pennsylvania, killed one person and left several others injured. March 4, 2016: Snow squalls caused a 40-car pileup on Interstate 93 in New Hampshire that left ten people hospitalized. Feb. 13, 2016: A burst of heavy snow led to a pileup of 50 cars on Interstate 78 in Lebanon County, Pennsylvania, that killed three people.